We have an enormous COS store smack in the middle of Montreal's downtown; impossible to avoid as a rack of candy bars at the supermarket checkout. And it was brimming with spring things in heaps of navy, grey and a mysterious soft salmon, so I popped in on a rainy day when I had the floor to myself. I walked out an hour later, not swinging a shopping bag and wondering how I was going to explain that to you. I have long admired strict clothes, and COS is a temple of quiet/cool nonchalance. Among hundreds of items, there were exactly three discreet abstract prints, and a peppering of stripes. 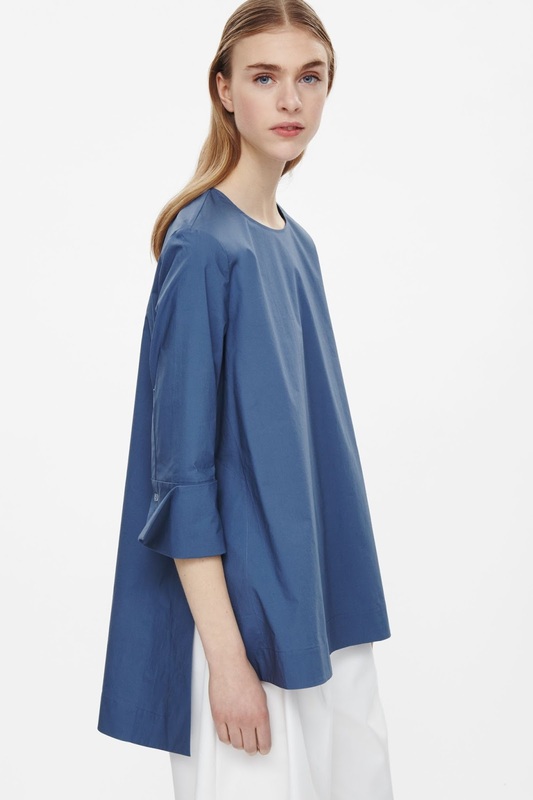 COS, owned by H&M, is Eileen Fisher meets hip Swede-with-a budget. 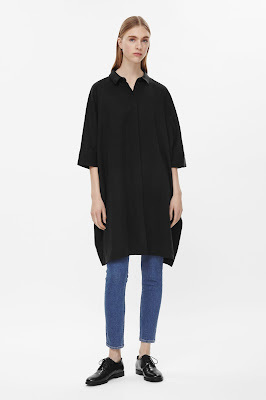 It's the sartorial equivalent of a Hotel Costes playlist: calm and assured, with a few tiny upticks of excitement (leather dress, audacious fringed linen top). I understand COS's aesthetic and am open to unconstructed clothes, but something was slightly off in quality and cut. I tried a dozen tops and jackets, and found the fit oddly constrained across the shoulders on pieces that nethertheless looked boxy, giving a disorienting sense of being in too small and too large at once. 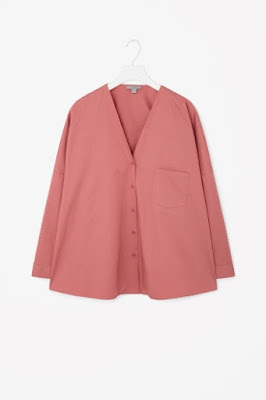 Petite women might be able to double-purpose the piece below, wearing one as an oversized shirt or a dress: I wear jeans and brogues all the time, so why was this not working? Maybe because I'm not 22? My sole shopping list item was a spring-weight top, so I crossed the street and chose, at ça va de soi, this substantial Egyptian cotton knit. It fit neatly, and made me look, I must say, like a woman with a good figure. But I paid twice the COS price tag, so only one item. The ça va cut isn't for everyone, either, and there's the key: if you find a brand or two that fits you, whether Gap or MaxMara, that ennobles your bust and gentles your hips, whose trouser rise gives enough room whether standing or sitting, whose skirt length is right without alteration, grab on and try to be a loyal customer, even if the price inflicts moderate pain or you sit out some years because the colours aren't your palette. I love the COS aesthetic and have the same issues with fit. Part of the problem I think is that they lean toward crisp fabrics which need a bit more shaping to look good on curves. When architectural clothes meet curves...perhaps a disconnect? I wonder of the top designer clothes of this type have something else that makes them work. I notice the model is rail thin, perhaps that helps? I'll be hitting ca va de soi on my May trip to Montreal. I know they have a shop here but it's more fun to shop elsewhere, I always seem to have better luck. I hear what you're saying about finding the right shop/brand. For me, Eric Bompard works and Brora doesn't. Talbots has one pant style and one t shirt that works, the rest don't. It's been a journey finding this stuff! My mother told me I looked pregnant in a top I was wearing recently. It went in the donation box immediately. Those over sized tops need a flat straight thin body to wear them. Tall would help too! 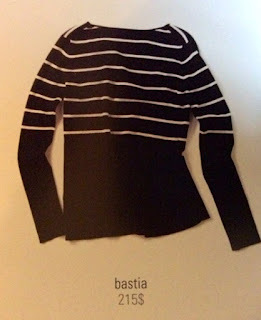 I love minimalist clothing, but somewhere it has to touch the body or at least skim it. I sew most of my clothes and there are a pair of sisters who design for McCalls Vogue patterns and that's their look. They are extremely popular. But to give them their due, mostly they do this in a knit or very soft fabric and it helps, but not enough most of the time. They are more complicated that COS combining patterns, adding large folds and pockets to the hip area. Not something my DD bust and full hips can handle. I am also not looking to hide my body which I feel that a lot of these garments are especially since a lot of people layer these over sized pieces. You'd think that it would be older woman friendly, but it really isn't. Unefemme: I can see they would not suit you, too. LauraH: I mourn the demise of the Heritage jean, which was just great for me (and nothing else there appeals.) Fortunately, stockpiled a couple of pairs. Happy to hear you are coming to Montreal! Northmoon: Oh no, that would kill it for me, too! Nancy K: Thank you for providing the expert analysis, spot on and helpful. (When I went into COS I thought I'd have to control myself!) The widely used term for these clothes is "lagenlook" and also include brands like Oska and Lilith. Occasionally a piece works (I am tall and average weight) but usually, not. But when I drop in to boutiques that sell these clothes, they are often packed with middle-aged and older women. As you say, extremely popular. That's how I feel about the Talbot's Signature Straight Leg - they discontinued it before I had a chance to get a second pair. I'm now wearing the Flawless 5 Pocket Straight Leg - not quite as good a fit buy miles better than anything else I've found. The COS line reminds me very much of the clothes carried at Motion. Like you I see a lot of older women in that store but very little works for me, I bought a dress once, that's it. And the really odd thing is that I never see anybody wearing this stuff out on the street, maybe that's not the right place to find that crowd. I was excited to come across a COS store in London last time I was there, but I too left empty-handed. Although the windows enticed, the dressing room mirror returned just one message: these clothes are not for me. I am on the short side of medium height, normal weight, short-waisted. No matter how much I may admire the unconstructed look on others, the clothes I feel good wearing provide some structure somewhere. 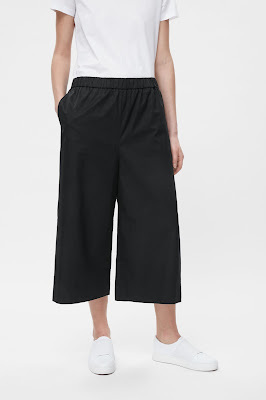 No Eileen Fisher for me either (but might be a recent convert to her shoes - incredible comfort!) Agree with Nancy, the garment needs to make contact with the body somewhere. I've never been in COS and will have to check it out. But I can't say I like much of their Look book. 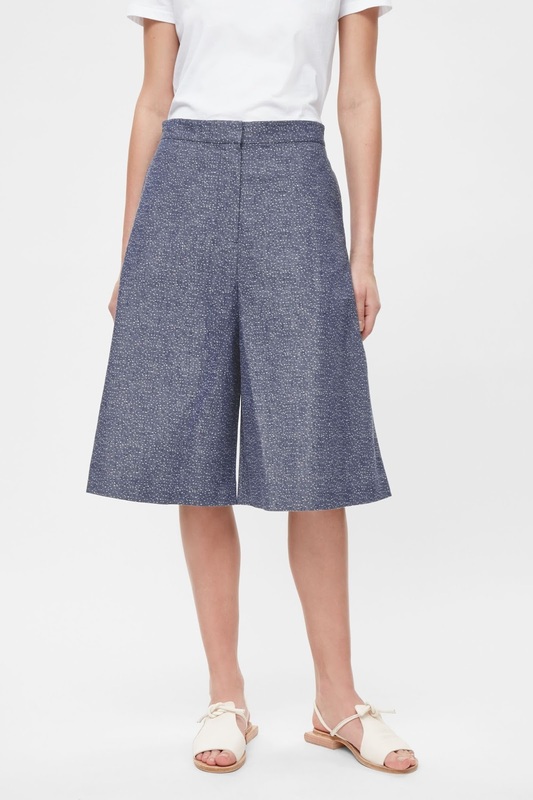 As a lifelong home sewer, I too find the fabrics too stiff for anyone who isn't tall and rail-thin. I love the Japanese equivalents, but the fabric is often more supple while still having a dramatic, geometric cut. Hmm. Curious. The store is not identified by name, because I wanted to discuss a particular aesthetic, but that's the place that inspired the post. Amy: What is odd is that on my second try, there were a number of women with definite curves trying on clothes. I will guess some are OK with the deliberate boxiness. Beth: By "Japanese counterparts" I am wondering whom you mean. If Uniqlo, I'd say COS' quality is better-more natural fibers-but a higher price point too. If you are thinking of Miyake, that takes way, way more cash. I ordered several pieces after reading about COS in the NY Times. Most look hideous on my curvy shape, but I found a couple of smartly tailored merino wool V neck sweaters that I love, and bought at half off an already reasonable price. I got these a year and a half ago and they still look great. Not Bompard great, but very nice. I look at the website only after receiving notice of a sale and then I study the images for any sign of 'boxy'. It's not very difficult. Some are positively 'tenty' and leave me wondering who would bother. I've come to the conclusion that it isn't worth the time it takes to search the site. Two posts within a week! How lovely to hear your distinctive voice again. As for Cos, i have only succeeded with two dresses from them, both in knit fabric and very fitted at the sholuder. Everything else is too swampy on my 5'4" and 32 dd bust. I am a veteran of Japanese fashion and find they work so much better, in part due to the superior fabrics and detailing, and also perhaps the average height in Japan is a lot closer to mine than in Scandanavia. Indeed, what a treat reading your posts! I haven't even bothered going to Cos as their designs don't please me at all, and I don't think they'd even look good on my 6ft, very slender friend M, especially since there are no long trousers for her. She is of UK origin and every trip to the Netherlands meant buying long-enough jeans and dress trousers. Their website isn't very useful either; the only thing that might interest me is a merino pullover, but they probably don't stock them this time of year. Pseu, I like very plain clothing as well, but the cuts look all wrong to me. I do love that Ça va de soi top! Interesting post. One of my favourite dresses (and I'm not much of a dress person) is from Cos - it hangs beautifully on me, although I will admit I don't feel that attracted to their more structured fabrics which remind me of Star Trek back in the day.... It must all be down to the type of figure they are designing for - I have a very unfeminine shape which I find really tricky to dress without looking like someone in drag, broad shoulders, narrow hips, not much in the way of curves. 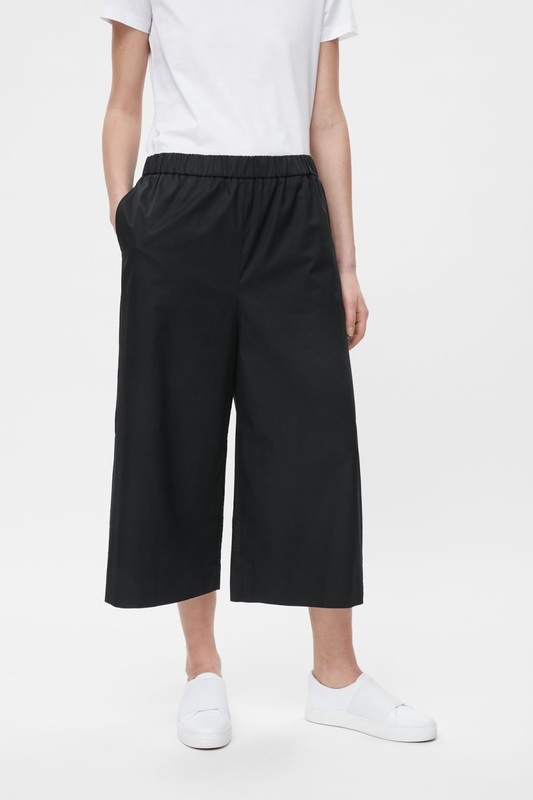 I love Eileen Fisher too, that seems to work on me. There are very very many brands that don't cut for my shape. On a slightly different note, I have felt gently chided into commenting! Have been visiting your blog sporadically for a few years (found when I was searching for inspiration for jewellery for my daughter's 18th) and have just scrolled back through recent posts I have missed. I'm slightly embarrassed to admit I hadn't fully realised the import of actually making a comment so have decided to rectify the situation. I wish you well, hope you enjoy your new job, and hope that you will continue posting as I will continue to enjoy reading (and commenting). Anna: I suspect, if I kept trolling COS, I would eventually find something that fits me, because I have a fairly standard shape, except for being tall, and their styles suit tall women. But it's not just the fit, it's the fabric, which as you noted, can be stiff. I found some of the shirt-tunic things (cotton, nice hand) appealing. Regarding comments, I believe many blog readers (not just readers of this blog), have become accustomed to the provision of free entertainment/edification, and genuinely do not stop to think that a real, unpaid person, is producing that post. This is not a flog blog, the type where the writer earns money for clicks to a site and a commission on purchases. So the occasional comment reinforces, even though there is no tangible reward. Living in a small town, I'd never heard of COS until twice tonight. On another blog, a woman was discussing her wonderful find. Being short, I doubt that not being near a COS store will be an issue for me.